Draft Gods is the first of its kind fantasy hybrid sports model. The sports tech founders are based in Raleigh, North Carolina and have created a platform that bridges the gap between season-long fantasy and daily fantasy sports, through a membership platform. The Sports Techie community blog spoke with DraftGod’s DJ Fiterman, Director of Marketing and Advertising, who is based in Houston, Texas, about their unique sports technology startup. 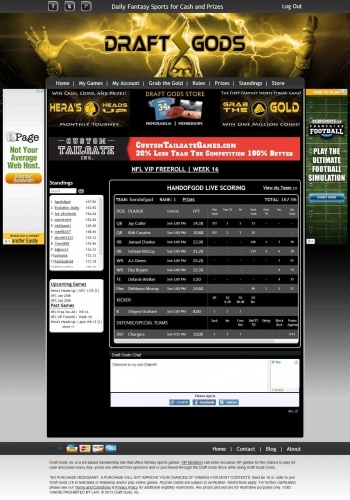 This daily fantasy community and gaming website launched in October, 2013. Their Fantasy gaming site has no entry fee and users can win cash, gift cards and sports memorabilia. They developed an interactive, user friendly game environment that is aimed towards the casual gamer. Serious gamers can easily upgrade to the VIP membership and get access to extra games and special features. The Sports Techie community can also find them on social media at Twitter, Facebook and Lockerdome. The PGA, NASCAR and the Sochi winter Olympic Games are just a few of the sports and sporting events that are featured by Draft Gods. Play daily fantasy sport including football, basketball, baseball, hockey, soccer, racing and golf. According to Fiterman, “Our UFC games are the only one of its kind on the Internet.” Look for FIFA World Cup Brazil 2014 matches later this year. Grab The Gold (streak “pick ’em” game). The Grab The Gold (streak “pick ’em” game) is easy, win and you go on, lose and try to earn another winning streak. An example of this game is the following – Deciding who will score the most fantasy points between Peyton Manning vs. LeBron James? Easy huh. Nail that and your win streak begins at one. Keep winning every day and grow your streak until you win a free prize or money. The first member to hit a streak of 30 winners wins the grand prize. The big payout streak may be set at 50 wins in a single month so even if you win 30 straight games any given month as a free member, you will fall 20 short for grand prize eligibility. Milestones will occur for winners who win 15, 20, etc. and more. The key to remember is that streaks reset every month. 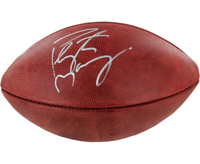 VIP members get unlimited picks a day which certainly increases the odds of winning all prizes that might include cash or an autographed Peyton Manning signed football, valued at $569.99 or 569,990 DraftGods Coins. The sites leaderboard shows your current streak and those ahead of you. This is a head-to-head month long tournament. 3 Draft Gods Coins are awarded for every Game. Look for special contests and special games tailor made for VIPs, LockerDome users and Facebook followers, Twitter friends and Google+ members. Their subscription model costs anywhere from a daily cost of $4.99, to weekly and monthly options, to the best value, a yearly charge of $179. Members have the opportunity to play a fantasy game EVERY SINGLE DAY OF THE YEAR, and a 10% discount in their store during the duration of any membership period. Use Draft Gods coins for prizes such as: cash, memorabilia, gift cards, memberships, coins (used in store), and special promotions via partner sites. Play the exclusive freerolls, use unlimited selections in Grab the Gold, receive expedited service, and much more. The store is designed to grow and cater to members. After logging in, users can participate in a forum and fantasy sports community on their blog, plus have the option to disable ads. The plan is to work with other sports sites to bring members different promotions and special community offers (one of the many advantages of being a VIP). Draft Gods are just finalizing an affiliate program, which should be up and running in the next few weeks. As an affiliate, you will have access to their banners and promotional material that can be placed on your site to maximize your revenue share. You will receive a percentage of every dollar spent by users that originate from the banner on your site. Not only will you receive this percentage of revenue from the many types of subscriptions purchased (daily, weekly, monthly, or yearly), but also from cash purchases made in their one-of-a-kind store, which features gift card, sports memorabilia, etc. Additionally, you will also receive a percentage of all purchases made by users originating from any affiliate that you refer to us. If you want more information about the new affiliate program for your site, please contact DJ at: dj@fitermansports.com. “Fantasy sports is a multi-billion dollar Industry,” says Fiterman. He mentioned how their web site has already earned an Alexa traffic ranking in the top 40,000, without any advertising. After an infusion of investment capital they will be able to execute their advertising component of the business plan that will complement their grassroots campaigns that have already been highly successful since their launch. This startup company was funded from personal funds and a few investors but they are now ready to solicit a major investor for a million dollar type investment in order to quickly scale their sports technology business and do it with haste so they can drive up revenue. They have partnered with Steiner Sports and Fathead, as well as Locker Dome, where they have a page in their network and will be working on cross promotional opportunities and white label games. Revenue will come from paid memberships, store purchases, ad revenue, and partnerships with other companies, private games and hosted games for third parties. Sports bars can offer Draft Gods games to patrons using their own logo. Competitors include Fan Duel and Yahoo! Both have advertising punch and banner ads that Draft Gods does not have yet. They have 6 employees. All are employed elsewhere and work on Draft Gods in the evening, weekends and spare time until they get fully funded. Sports Techie, There are fantasy sports gaming web sites that charge you money to play and by the next week you have burned through your budget and have no more cash to play any further. Signing up for a free Draft Gods account is easy and costs you nothing. If you want to upgrade to a premium VIP membership which gives you more game, better prizes and discounts in store using site currency, just do it. I personally love the “ManCave” prizes knowing that you can fill your room up with this category as more and more new sports tech products hit the market. A prize example I can see down the road is winning one of the only 116 copies of Nintendo World Championships that were ever made, as part of a special event in 1990. An eBay bid of US $99,902.00 won the NES Nintendo World Championship Cart RARE Torn Label 100% Authentic Adult Owned auction originating from Raleigh. For those in the Sports Techie community that dig this kind of historical sports tech, perhaps you can win one of the other 115 copies via a future Draft Gods daily fantasy game for free. Look for new games in the next few months. The MMA Industry is a vertical market they will business develop further. They hope to find an insurer for a new game with a cash prize of one million dollars so if you are out there, give DJ a holler. No better way to start a win streak than letting it ride on the NFL and in particular the Seattle Seahawks to defeat the Denver Broncos on Sunday at Super Bowl XLVIII at MetLife Stadium. If you lose this #SB48 game, then simply use your smartphone, table or computer to start again the next day until you achieve a significant milestone and win Draft Gods cash, prizes and swag. If you are interested in becoming an affiliate, contact Draft Gods immediately so you can get in early, and tell DJ THE Sports Techie sent you please.